Preheat the oven to 375°. Spray an 11-inch tart pan with a removable bottom with vegetable oil spray. In a food processor, combine the flour with the sugar and salt and pulse once or twice until combined. Add the butter and pulse until it is the size of small peas. Lift the lid and sprinkle with the egg- yolk mixture. Pulse 5 or 6 times, until the dough is crumbly. Pour the dough into the prepared tart pan and press to form an even crust. Use a flat-bottomed glass dipped in flour to tamp it down. Bake the crust in the lower third of the oven for about 25 minutes, until it is golden brown. Lower the oven temperature to 350°. In a large saucepan, combine the water with the wine, sugar, sage, cloves, cinnamon and vanilla bean and seeds and bring to a boil. Simmer for 5 minutes, then add the quartered pears. Cover with a large sheet of parchment paper and a lid slightly smaller than the saucepan and cook over moderate heat until the pears are just softened, 25 to 30 minutes. Using a slotted spoon, transfer the poached pears to a paper towel-lined plate and let cool slightly. Cut each wedge in half lengthwise. In a small skillet, cook the butter over moderate heat until golden brown and fragrant, about 4 minutes; pour browned butter into a small cup. In a medium bowl, using an electric mixer, beat the eggs with the sugar, vanilla seeds, orange zest and salt. Add the flour and beat at low speed until smooth. Add the brown butter and beat the filling at low speed until incorporated. Pour the filling into the baked crust. Arrange all but 3 of the pear wedges on the custard in a slightly overlapping circle, with the narrow ends pointing toward the center. Trim the remaining 3 pear wedges and arrange them neatly in the center. Place the tart pan on a baking sheet and bake for about 1 hour, until the custard is golden and set. Let the pear tart cool completely before serving. The recipe can be prepared through Step 2 and stored in an airtight container for up to 2 days. 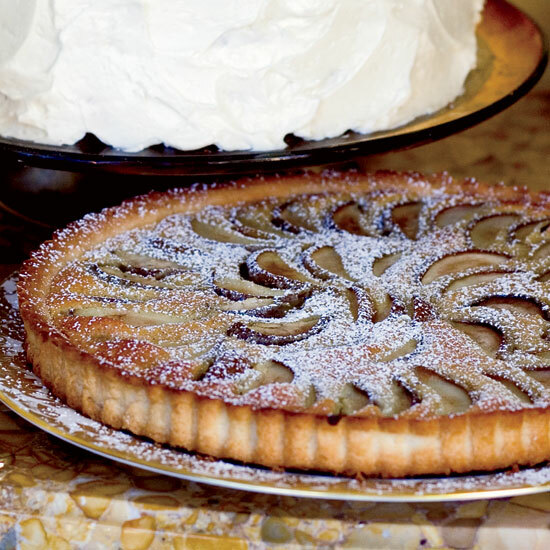 The finished pear tart can be stored in an airtight container overnight at room temperature. Pear flavors are common in white grape varieties from France's Rhône valley, particularly Roussanne, which makes it a natural complement to Besh's decadent pear and brown butter tart.